I can say that dal parathas are the softest parathas ever i tasted...just love it a lot..so soft,fresh n very tasty parathas.Few days back i tried Moongdal n Spinach Paratha..the perfect combo and the parathas turned out so flavorful,soft and delicious one.My Kids loved this parathas a lot..they finished the parathas without troubling me. My Hubby too liked it very much and he requested to make it often, so happy with my cooking. Addition of Garlic n Ajwain makes the paratha makes more flavorful n also garlic -spinach combo works really very good...I made this parathas for dinner...before my marriage i never had any greens for my dinner..My Mom use to say that greens are not to take for dinner as it won't digest soon..is it?? Dunno but simply will obey them but, after coming here everything has changed..I use to make palak paratha, palak paneer, methi mutter curry, aloo methi etc with greens for dinner...To avoid such problems i use to add cumin, garlic, ginger, hing to the greens whenever i cook especially for dinner. If you have any views regarding this plz feel free to share with me. Pressure cook moongdal with turmeric powder,then mash them nicely and keep aside. Heat oil in a pan,add cumin seeds when sputter add finely chopped garlic fry lightly then add finely chopped onion and saute till turns light golden color. After that add finely chopped spinach n pinch of turmeric powder and saute for 1 minute and turn off the stove. Allow to cool lightly and blend it to a fine paste and keep aside. Take a wide bowl,add flour ,salt and ajwain seeds mix well then add cooked n mashed moongdal n blended palak paste and knead it to a smooth dough. Do not add water ,dal n palak paste have enough moisture to knead the dough.lastly add 2 tsp oil and knead well and cover the dough and keep aside for 20-30 minutes. After that divide the dough in to 12 equal balls and using a well floured surface roll one ball at a time to 8" little thick paratha and repeat the same for all the remaining balls . Heat a griddle,when it gets really hot ,toast the paratha on both the sides with few drops of oil and remove from the tawa. 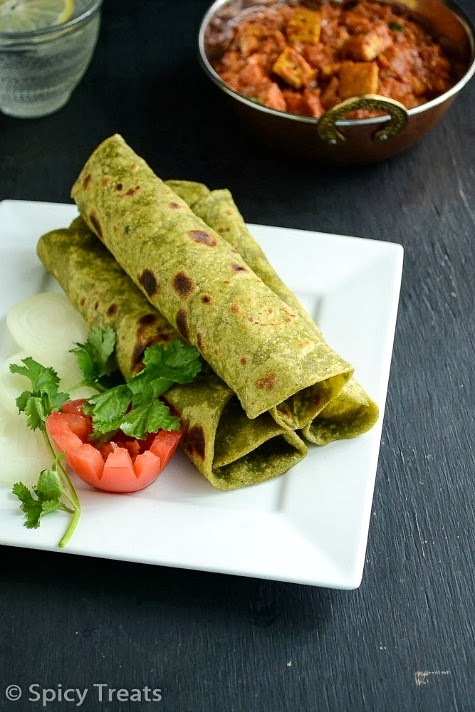 Super soft Moongdal Palak Parathas are ready to serve with any curries or simple pickled curd. I cooked about 3/4 cup of yellow moongdal for kootu and from that used 3/4 cup cooked n mashed dal to my paratha.. If you want you can add some green chillies to the onions -spinach mixture and blend .The garlic-onion-spinach paste was very yummy n flavorful.can use as a spread for bread sandwich or as a dip. I am sending this recipe to the event Dish It Out-Spinach and Garlic by Vardhini. 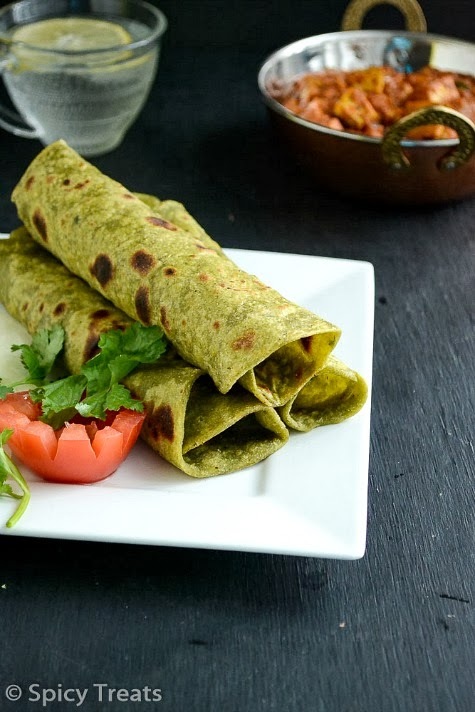 very flavourful and tasty parathas..will love to try this out..sure its very healthy !! i have greens for dinner, not sure if there is any such thing..but adding cumin, ginger, garlic, hing is really good for digestion.. 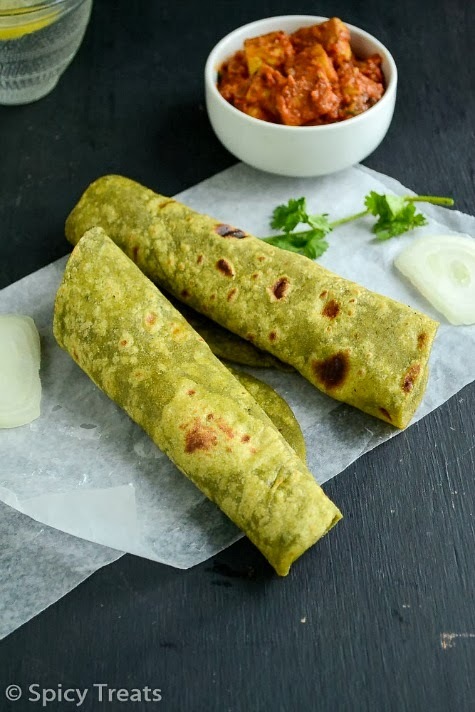 Adding dals to the parathas turn them soo soft, lovely combo, i dont bother to enjoy this fabulous parathas anytime..
very healthy palak parathas..looks yum..never seen moong added to this! Looks so colorful and delicious. Love that platter. Delicious and mouthwatering parathas dear. I 'm going to prepare this in this week. mmm....these look so yummy! This is my first time here and I loved your recipes. Looking forward to sharing more recipes with you!! WOW Sangee...nice and healthy parathas..great combo of ingredients..would love to include this in my menu as well. U have some awards waiting in my space.. Pls do drop by and collect them dear..
perfectly done !! looks so healthy and delicious !! 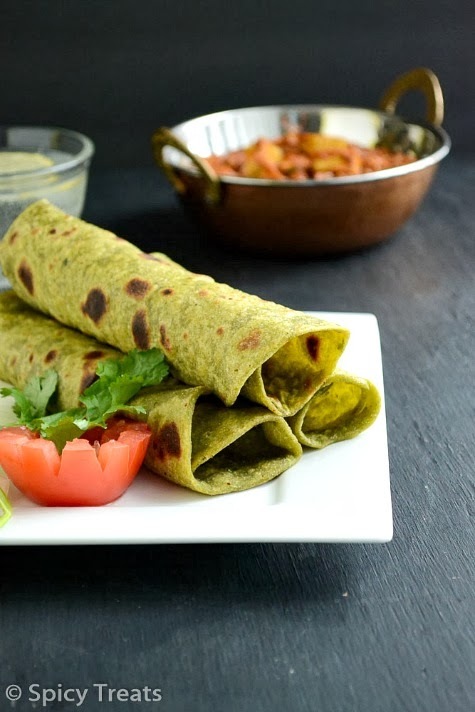 Healthy and tasty parathas. Look so amazing. Thanks for sharing.